The basics of plasma cutting are similar to TIG welding. It’s a process which uses a high-velocity jet of ionized gas (typically air) through a constricting orifice (small nozzle). This ionized gas (plasma), conducts electricity from the electrode (torch) to the work piece. When the arc makes contact with the conductive material you want to cut, it passes through the metal, melting a thin area and ultimately severing the metal. Here are some advantages and disadvantages of plasma cutting as well as tips to help you get started once you’ve purchased a plasma cutter. 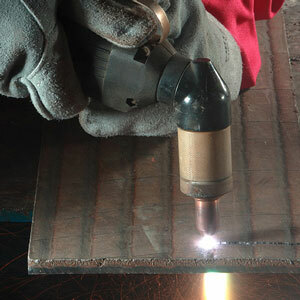 Unlike oxy-acetylene cutting, plasma cutting works on any electrically conductive metal. The oxy-fuel process will not work on aluminum or stainless steel. 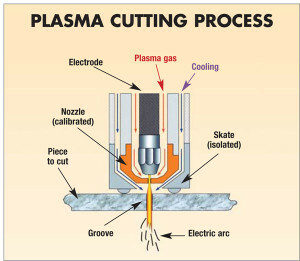 Plasma also produces cleaner cuts due to dry air being used in most applications. Because of the high temperature of the plasma cutting arc (~20,000 degrees F), it’s a much faster method of cutting than oxy-acetylene (~6,000 degrees F). There is also no pre-heat cycle. Plasma cutting is also much more precise and there is a much lower chance of surrounding areas being negatively affected by warping or pain damage. Plasma cutting definitely requires a higher upfront investment but once you are setup, you only need to replace your tips and consumable electrodes. Getting started in oxy-acetylene cutting may be cheaper at the start (see oxy-acetylene kits we recommend), but you then have the added expense of gas tank refills. In addition, when you factor in the speed benefit and the fact that time is money, a plasma cutter may seem like an excellent investment. There is obviously some danger to any type of welding or cutting so proper safety measures should always be followed. 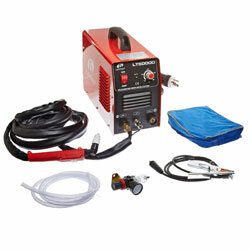 Because a plasma cutter generates such a high amount of heat, the risk of electric shock is also greater. Just follow the manufacturer’s directions and safety precautions and you may actually be safer than with an acetylene setup where you’re working with highly flammable oxy-fuel. Read the manual – It goes without saying, but take the time to read the owner’s manual. While most plasma cutters have only 2 settings (on/off switch and amperage control), you want to completely familiarize yourself with your particular model and advice from the manufacturer. Be Safe – Protect all exposed skin with gloves, a welding jacket (or denim or other flame-resistant clothing), and welding helmet (#3 to #6 shade). Always have a fire extinguisher on hand nearby. Support – Use your non-cutting hand to support your cutting hand. This provides greater control and stability. Push vs Pull – While most users prefer to pull the torch toward them while cutting, you may find it easier to push it way instead. Angle – Keep the torch at a 90-degree angle for cutting. Use a Checklist – Prior to cutting, be sure to inspect the cutting tip, shield cup, electrode, and any cords or lines. Get Dialed In – When cutting, make sure sparks are falling from the bottom of the metal indicating a clean cut. If that’s not the case, you may need to adjust your amperage, angle of the torch, or speed in which you cut. You should in fact make a test cut on the same type of material prior to cutting on the material you plan on using. Do this to check your amperage and cutting speed. Use the Drag Shield – If your plasma cutter has one, use the drag shield. It allows you to rest the torch on the piece you’re working on and maintain an optimal 1/8” standoff. Angle the Start – It’s easy to pierce thin metal to start a cut but on thicker material, start at a 45 degree angle to avoid a backsplash and along with it, increased wear on your consumables. Straighter is Better –Use a clamped straight edge for best results when precise cuts are needed.